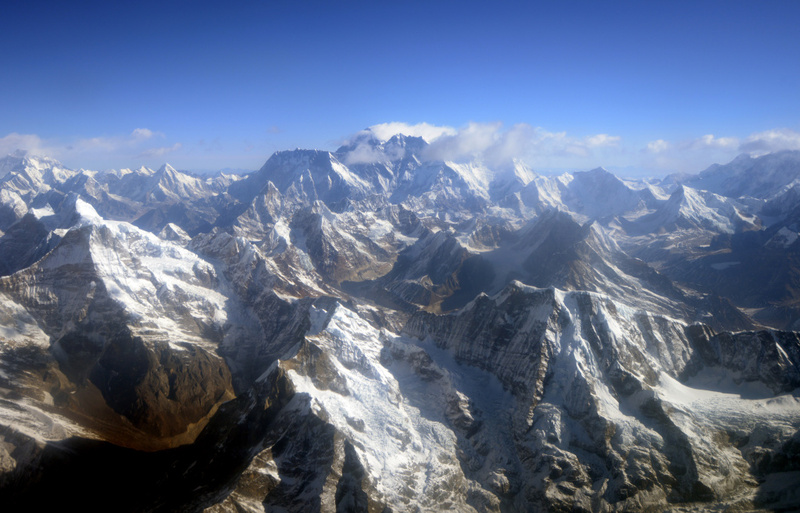 This photograph taken from an aircraft shows an aerial view of Mount Everest and The Himalayan mountain range, some 140kms (87 miles) north-east of Kathmandu on April 3, 2013. As search and rescue teams continue to comb disaster areas in Nepal looking for remaining survivors of Saturday's devastating earthquake, a rescue mission of a different kind is under way. Scientists are in a race against time to find 28 data monitors scatted through the country. The information will unpack the effects of the deadly magnitude 7.8 temblor, and about whether— and how— Mount Everest has shifted. Ken Hudnut, a geophysicist with the U.S. Geological Survey, says the devices contain information that will help scientists understand why the damage wasn't as bad as seismologists would have predicted, for a earthquake that big and with an epicenter that close to Kathmandu. And that could be good news for Los Angeles, because there's a similar fault system under L.A.
"Here in L.A., if a flat part of the fault system beneath L.A. breaks in a way similar to this earthquake," Hudnut says, "maybe the ground motions in L.A. aren't going to be as bad as we thought." The problem is that the monitors only have a two week memory and they're located in remote areas of the country that can only be accessed by helicopter. "We could have a situation, if we don't get on it fast," Hudnut says, "where we start to overwrite the data and we will lose the data from the main shock. It's such a critical data set, we really don't want that to happen." To hear the full interview with USGS geophysicist Ken Hudnut, click the link above.